Last year wasn’t so great for cars in movies, but 2017 more than made up for it. Here’s a rough list of our favorite cars in the movies that came out this year. Full Disclosure: I haven’t seen every movie that was released this year. Additionally, some movies on this list are favored more for how the vehicles were used, and not necessarily their objective performance capability. Starting the year off with punch to face, John Wick: Chapter 2 managed to be just as badass as the first installment, and the opening number with Wick piloting a Chevelle on his war path to retrieve his 1969 Ford Mustang Mach 1 from the first flick left us all hoping there’s more cars to come in Chapter 3. Not only did Logan manage to finally deliver a good Wolverine movie, but it’s also one of the few near-future set movies that didn’t go too crazy with concepts of the cars of the future. Instead, we got an appropriately conservative taste of what’s to come with a stylish Chrysler limousine, toughened-up battle-ready trucks, a cool cycloptic cab-over van, and realistic autonomous truck pods in a sequence that justifies our fear that the future will be terrifying. I checked out of the Fast and Furious franchise somewhere around the fifth movie, but Jalopnik’s Kristen Lee is still a fan, and the latest movie apparently really delivered this year. Sure it’s full of dumb stuff, but it’s fun dumb stuff, and again, we got the theme of autonomous cars being used to kill you. See, that’s fun! Look, they put a bunch of supercars on ice and added explosions. What more do you people want? Considering the lowrider community is often overlooked or shrugged off by the majority of enthusiasts, there’s still a lot passion and skill that goes into the completely customizable rides and the people that build them, which shouldn’t be ignored. One of the smaller car movies released this year, Lowriders dives into that culture, featuring a lot of real, sought-after and collectable cars cast into the film. It’s definitely worth checking out if you haven’t already. 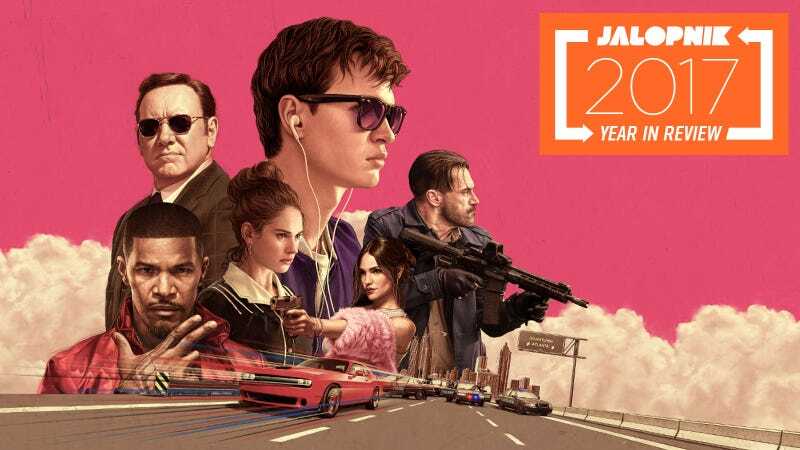 One of the best stunts of the year is undoubtedly the alleyway dance in a Subaru WRX Ansel Elgort’s Baby pulls off in the opening sequence of Baby Driver. While I personally didn’t quite gel with the characters, nor the approach director Edgar Wright was going for with the movie, I can’t deny that it isn’t well-crafted and fun to watch, and one of the more popular pop culture movies of the year. It even made me tab over to Craigslist to skim through for my own speedy WRX for a few weeks. Often coined the “female John Wick,” I think Charlize Theron and Atomic Blonde did enough to differentiate itself. Set in the 1980s, the movie delivers on atmosphere with a killer soundtrack, amazing fight choreography, and some excellent automotive eye candy. Almost every one of my favorite scenes in the movie involves some sort of car carnage. The movie drags along in parts, but definitely a good watch if you haven’t seen it yet. While I don’t think the movie intentionally tried to patronize southern audiences, watching Logan Lucky in a theater just ten minutes away from Charlotte Motor Speedway (the setting of the movie) felt nearly insulting in regard to many of its scenes. The characters are all overcooked stereotypes, and unlike director Steven Soderberg’s Ocean’s trilogy, which he rips off with a southern setting in Logan Lucky, instead of laughing with the characters, they’re clearly written to be laughed at. On top of all of that discomfort, the movie feels a little disjointed in its second half, the heist in the basement of Charlotte Motor Speedway holds almost no tension, the most interesting characters are used too little or introduced too late, and there’s virtually no car action! Still, the movie does hold some emotional weight, and if you’re at all curious about it, some people did end up liking it. In what felt like one of the longest movies of the year, Blade Runner 2049 builds upon, and grows beyond the original universe of the first movie. It’s visually stunning, and some of the most intense and striking moments in a movie spoiled with such moments involve its vehicles—the flying cars that we’ve all been promised in just two years for decades, fully realized. They’re even branded as Peugeots! According to Kristen Lee’s review, the movie is unsurprisingly not great. While trying and failing to rip off Fast and the Furious, it does at least manage to get some of the cars right. The cars deserved a better movie. Wheelman is a small little action flick that debuted on Netflix with the typical plot; guy gets out of prison, has to go back to his old ways to pay the bills, and gets double-crossed. Only it takes place almost entirely in a car. It’s a bit grueling, although intentionally, but a pretty cool experiment. Some other random fun cars I spotted in theaters this year was the controversial Ford Mustang II in Guardians of the Galaxy Vol. 2, some incredible animated racing cinematography in Cars 3, the taxi scene in Kingsman: The Golden Circle, and the fun scene where Spiderman learns how to drive in an Audi TT. Looking ahead to next year, the Black Panther trailers tease a car chase, Ready Player One teases a virtual car chase on meth, Sicario 2 will probably have a heart-stopping street sequence of some sort, Deadpool 2 may try to top the stunning opening of its first movie, and Tom Cruise looks like he’s back on a motorcycle for Mission: Impossible 6. Sounds like it will be fun! Did I miss any good movie cars from this year? Let me know! I’ve got some time to catch up on movies.